What's the truth about tarte? Another one of my best friends, soul sisters, and roommates from college asked me a very important question today, which has sparked my interest and shall result in yet another blog post for today. She asked about Tarte cosmetics and whether they're actually organic/natural as they claim to be. So, I began my investigation. While the Tarte website features the words, "natural" and "naturally" several times, I was unable to find a list of the ingredients for any of the cosmetics they feature on the site. I would imagine that any brand known for its "natural" ingredients would flaunt them for the world to see. If you click on Tarte products to view them individually, there is a link next to the product that says "see all ingredients." Don't be fooled. I clicked on it for several products and the ingredients page was the same for each product with a picture of each ingredient: Amazonian clay, acai berry extract, acerola, vitamins A, C, E, goji berry extract, maracuja, mineral pigments, olive esters, peppermint oil, pomegranate, and rice bran wax.. At the bottom of the homepage, Tarte claims that their products are ALWAYS FORMULATED WITHOUT: parabens • mineral oil • phthalates • triclosan • sodium lauryl sulfate • synthetic fragrance • gluten. This is all great news, but if we're talking real life talk, there are FAR more than 8 unwanted/dangerous ingredients that can be found in cosmetics that claim to be "natural" or "organic." In my search to find an appropriate image for this section of my blog I got lucky and came across an image of the Tarte Park Ave Princess Waterproof bronzer IN ITS ORIGINAL PACKAGING. Extra lucky for me, the image shows all the wonderful ingredients! (Below the ALWAYS FORMULATED WITHOUT list, of course). While some of the ingredients were fine, others were listed with concerns when I searched them in EWG's Skin Deep Cosmetic Database. A few examples are listed below. Note that all "organ system toxicity" concerns are non-reproductive. Pentylene Glycol: There was limited information available on the cosmetic database, however I did find a source that claims that this synthetic humectant can also be used as a preservative and solvent. Yes, the word synthetic did appear in the previous sentence. Studies have shown that it can be a skin irritant, causing contact dermatitis. It may be beneficial to look at other online sources for more information on these ingredients as they appear in cosmetics. As always, my best suggestion to everyone is simply to check all ingredients on your cosmetics before purchase. I did some more digging and found that cosmetics and personal care products labeled "organic" are not regulated in the same way that foods are. Unless your cosmetics have that USDA ORGANIC stamp of approval, they're simply not organic. Cosmetics with the USDA ORGANIC stamp of approval sport it proudly, as they should! Unless products are USDA certified, the main cleansing ingredients and preservatives are usually made with synthetic and petrochemical compounds (OCA, Coming Clean Campaign). You would think we should all know better by now- that advertising isn't always truthful and words/graphics can be slapped onto a product to make it sound more appealing, natural, and worth every penny. I'm guilty of believing what "they" say sometimes too. I have to say though, I'm getting better at being a detective. To answer my girl's question about Tarte cosmetics- are they organic/natural? Not by definition. But, I was pleasantly surprised to find that so many of the ingredients on the Park Ave Princess Bronzer packaging were considered "safe" even though I couldn't pronounce them. It goes to show that while it's important to look at the ingredients in cosmetics, it's also important to research them. Just because some ingredients sound super dangerous and cancer-causing, doesn't mean that they are! Below are some links that provide information on USDA certification, fake and real organic/natural brands, and EWG's Skin Deep Cosmetic Database. Sadly, I will admit that while doing my research I found out that my Nature's Gate shampoo is a fa(h)king fraud. Again, I'm no expert! One day I'm telling you all about my "all natural" shampoo and the next day I'm cursing Nature's Gate. We lather, we learn. But I'm thrilled to find out that Dr. Bronner's is a trusted, certified organic brand. I use Dr. B for shower soap. 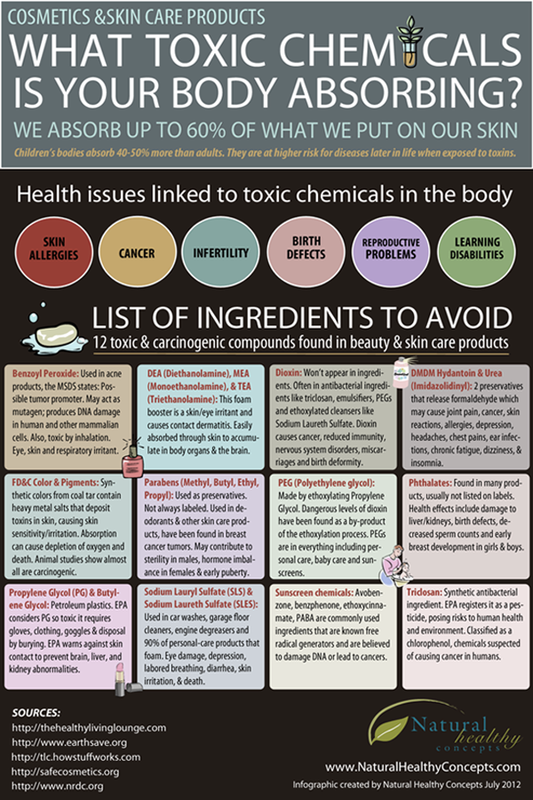 Also click the picture below to take a peek at the most harmful chemicals found in cosmetics and skin care products. "Coming Clean Campaign ." Organic Consumers Association . N.p., n.d. Web. 18 May 2013. <http://www.organicconsumers.org/bodycare/index.cfm>.